This seems to be someone's post-installation checklist, which they've shared. There are many common 'out of distribution' changes that are used by many people. Walking newbies through each process (or even doing it yourself for many systems) can be painful. Newbies would be pointed to the line item(s) to get what they want, and really don't care that it lacks details. They generally operate by rote, as we all do for things which we are unfamiliar with and don't care to learn about. I have no problem with the intent, as long as it's open source and easily vetted. i am arguing new users won't learn or learn the wrong things. and the interface is not easily usable for them. and we have kickstart, respins, remixes. metapackages and such. 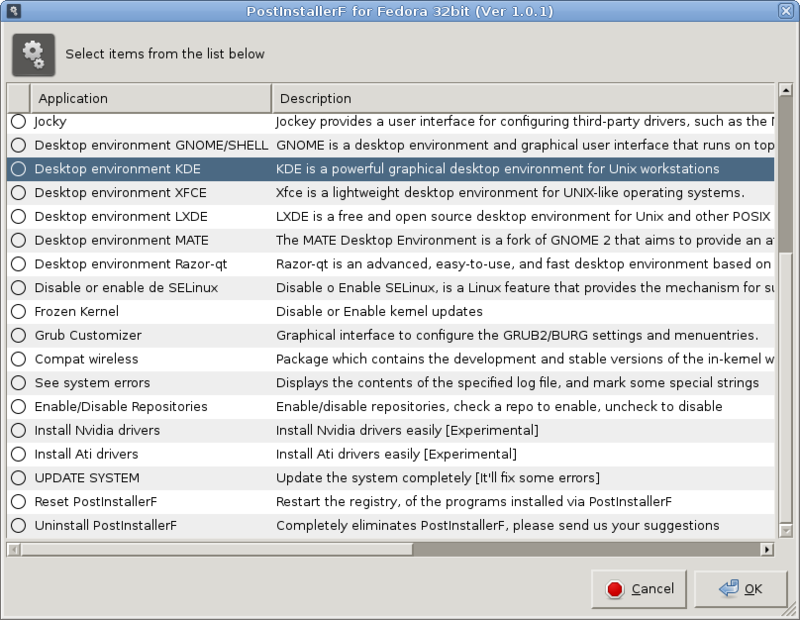 Autoten from Dangermouse is no longer supported, and EasyLife has improved since then and is the only way I know for newbies to install packages that add usability to Fedora. Maybe suggesting the author to contribute to EasyLife would be better than creating another duplicate package from scratch. those apps come and go. i guess making them is a way to learn. I do not, but, I think this program is excellent, maybe not very nice visually (visually is better than the others). 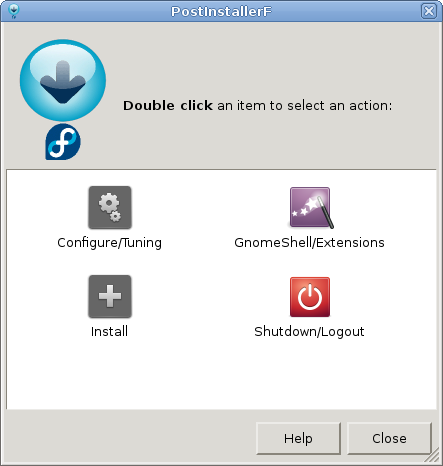 Postinstallerf team, packaged programs that do not exist in Fedora (out thirdparty repos). I see PostInstallerF goes beyond that Eeasy Life. According to one developer says, the vision they have is something like Sabayon Rigo, or AppCenter, with special functions, and programs outside of the box. Why not help with a new design? 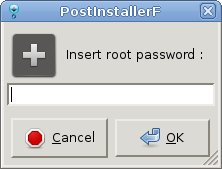 I love postinstallerf, so cute, great tool. Helped Me when I began with Fedora about 1 year ago. 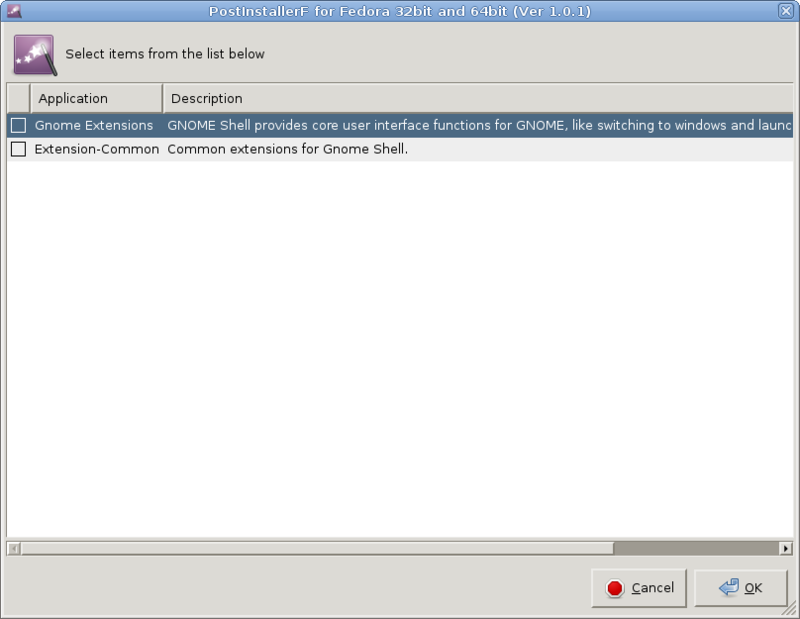 Fedora Registry Optimizer 2013 Pro. indeed, one of the options is "Restart the registry of the programs installed via PostInstallerF"
Post Installer, work great. my favorite script, when I was migrating to Fedora. Is ugly but effective. I will wait a new redesign. As a relative newby user (ex Windows power user, Visual Basic, written asp and HTML, DOS batch files so not complete ignoramus) I still find some simple at Redmond tasks involve hours of research followed by using an unfamiliar command prompt - often without success especially when the subject of tar balls comes up. Some of these tools may be bad but they save people like me hours they haven't got - until they trash the system (I forget how many times I reinstalled until I learnt caution). Probably unnecessarily but easier than solving the problem. who said anything about command line? 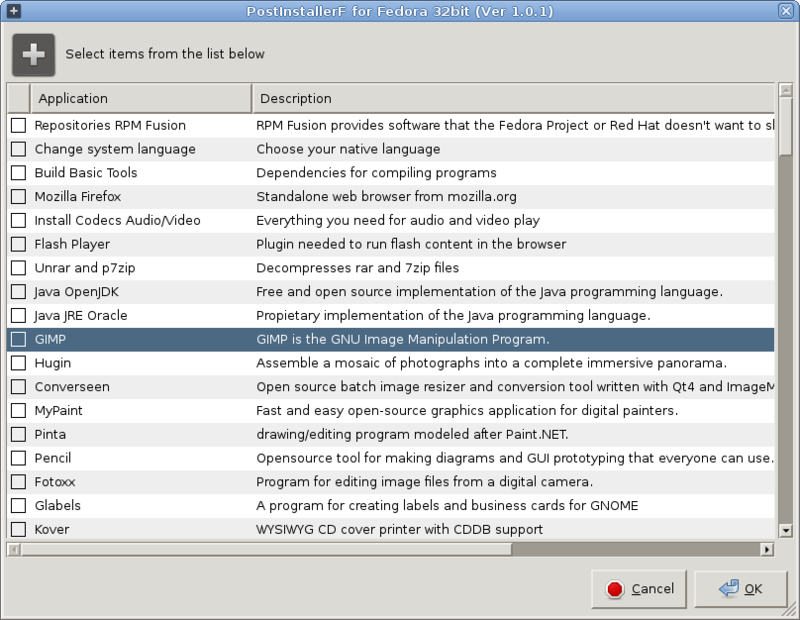 a lot of the things there can be done with the graphical package manager installed by default. the above mentioned app does NOT install anything from tarballs, everything uses the package management, from Flash to Chrome to Steam. how about the queries "i know how to do it in Linux, but how the * do i do it in Windows?" such questions will always be asked as Linux is not a Windows clone, things are different. These types of programs are useful in streamlining the setup process. Many users simply want the system to work the way they need it to, if they wanted lessons they would spend the time to dig in and and get their hands dirty. Your complaining comes across as techno elitism, if you have an easier solution trot it out and let folks critique it, otherwise your are just noise. Nicu Buculei: LibreOffice was not included for the DVD version... the graphic manager is good, but would be better if the user is proposing more specific solutions, and not get lost in packagekit. Read the comment of Alan Cox. not having LibO on the DVD version is just a bug, it should return. really? read it http://kuboosoft.blogspot.com/2012/12/que-hacer-despues-de-instalar-fedora-18.html the guide where born PosInstallerF have better guides than yours.